Hammer Projects: Jamilah Sabur is organized by Erin Christovale, assistant curator. Jamilah Sabur’s practice is a meditation on bodies: celestial bodies, planetary bodies, bodies of land, bodies of water, and the spaces in between. This exploration is less an attempt to analyze a set of moving parts individually than a consideration of how they work in tandem to maintain the life cycle of our universe and how the human body in particular contributes to this action through everyday rituals and ceremonies. 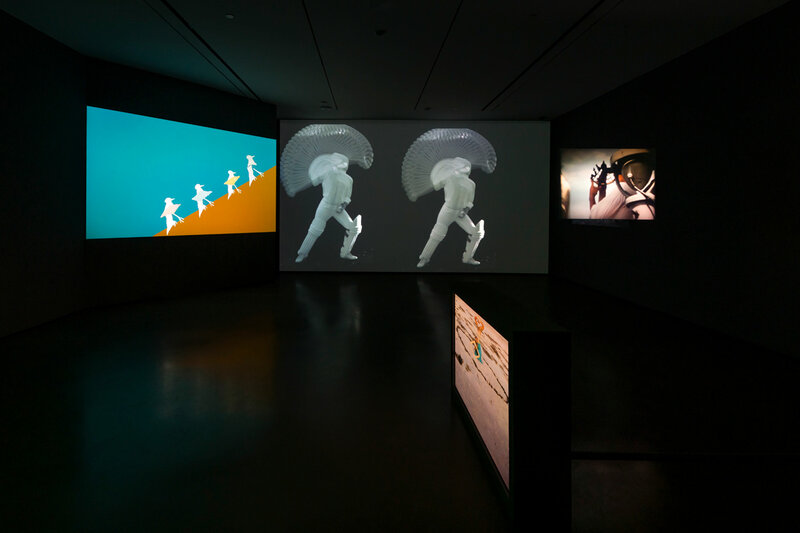 Focusing on the Caribbean as a place that is often contextualized by its alluring landscape and contentious history, Un chemin escarpé / A steep path (2018) is a five-channel video installation featuring Sabur as a shape-shifting figure that traverses and communes with various sites within the region. 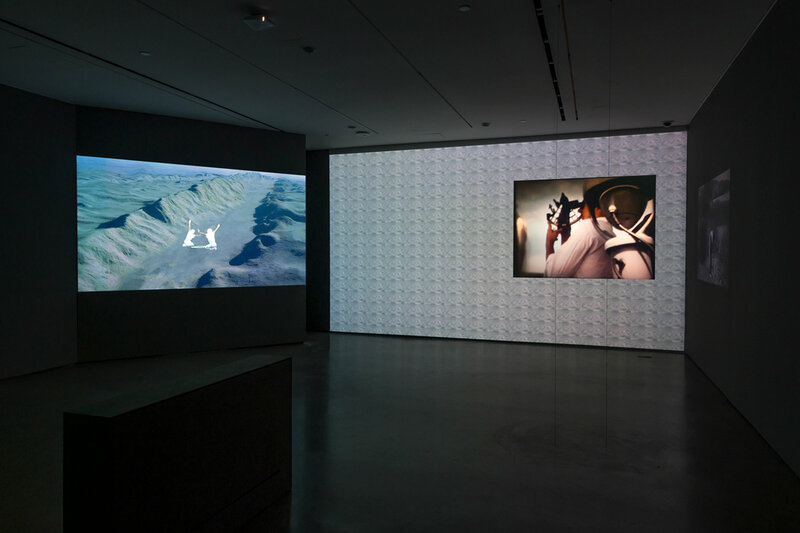 Drawing on metaphysics, postcolonial theory, and familial ties, the artist blends geographic sites with cultural artifacts in an attempt to generate a new theoretical framework for the landscape at large. The installation’s French title alludes to the geographic feature known as an escarpment, an area where faulting or erosion over time has created drastic changes in elevation, producing a steep slope or long cliff. Sabur explains, “The word references geology; it’s also related to the concept of armament, or the fortress. And it’s very much related to time—repositioning how I think about this moment, this space. Escarpment as a metaphor for origin: imagining everything being borne of this slope. I’ve been interested in the mountain form; escarpment makes me think of the other side of the shape, or its interior. Now I’m below the surface of the water, this thing that’s continuing and geographically infinite.”1 The term escarpment functions as an entry point for Sabur, giving her permission to bend the boundaries of space and embed herself deep within the fabric of the islands—from the highest peaks to the depths of the ocean floor. Taking on the role of explorer as a means to redirect a term that harbors a history of violence and colonialism, Sabur is often seen masked and cradling a rhomboid object. The rhombus shape, a recurring symbol in the artist’s work, originates from the architecture of her mother’s childhood home in Jamaica. It was the central feature in the latticework above the entryway, functioning as a threshold where outside and inside merge. Her allegiance to this feature is wrapped within the principles outlined by the French philosopher Gaston Bachelard. In The Poetics of Space (1957), Bachelard applies the method of phenomenology to architecture in prioritizing personal and emotional response to a space over the technical aspects of its construction. He focuses largely on the notion of home as a site that stimulates both memory and imagination. 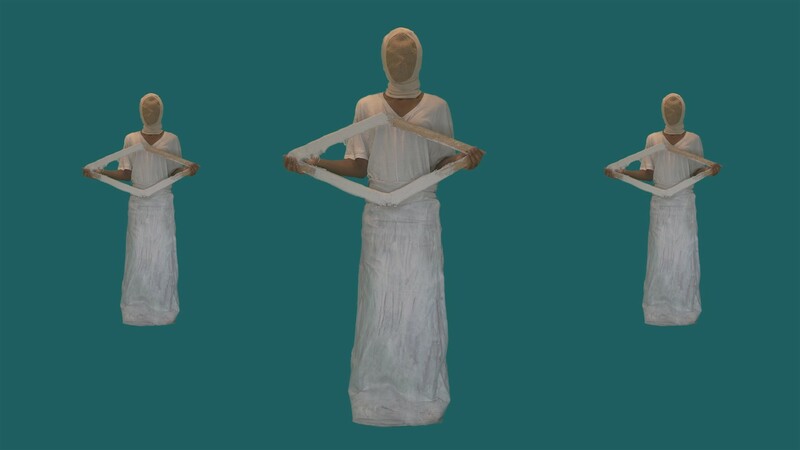 The rhomboid object, which serves as a stand-in for “mother” or “motherland,” becomes an extension of Sabur, functioning as a ritualistic device and navigational tool that activates and unlocks seemingly impenetrable territories. Her desire to remain masked, obscuring her vision and allowing other senses to lead, is a central component of her performance philosophy, in which she relies on a perception that she describes as being more haptic. This desire is also associated with the theory of enactivism, which suggests that cognition arises from a dynamic interaction between an active organism and its environment and that our environment is one that we selectively create through our capacities to interact with the world. Shifting the terms of her cognitive experience through a more embodied recognition allows Sabur to enter trancelike states, which enable the potential for time travel, breaking the confines of past, present, and future. Mojuba: an expansive memory refusing to be housed in any single place, bound by the limits of time, enclosed within the outlines of a map, encased in the physicality of body, or imprisoned as exhibit in a museum. A refusal that takes its inheritance from the Crossing, which earlier prophets had been forced to undertake from the overcrowded passageways in a place called Gorée, the door of no return, still packed centuries later with the scent of jostled grief so thick that no passage of human time could absorb it. In one sequence Sabur doubles and materializes in a three-dimensional animation of the Vema Fracture Zone, an oceanic feature that offsets the Mid-Atlantic Ridge. This sprawling, mostly underwater mountain range slices through the middle of the Atlantic Ocean. The fracture zone has been of great interest to oceanographers and seismologists, who have noted microearthquakes and gravity anomalies in the region, suggesting seafloor spreading. Visually the fracture zone resembles a massive rupture carved into the earth’s core. Seated within the crevices of the rupture, Sabur ceremoniously places the rhomboid on the floor and starts to sway from side to side, lifting her hands in worship. 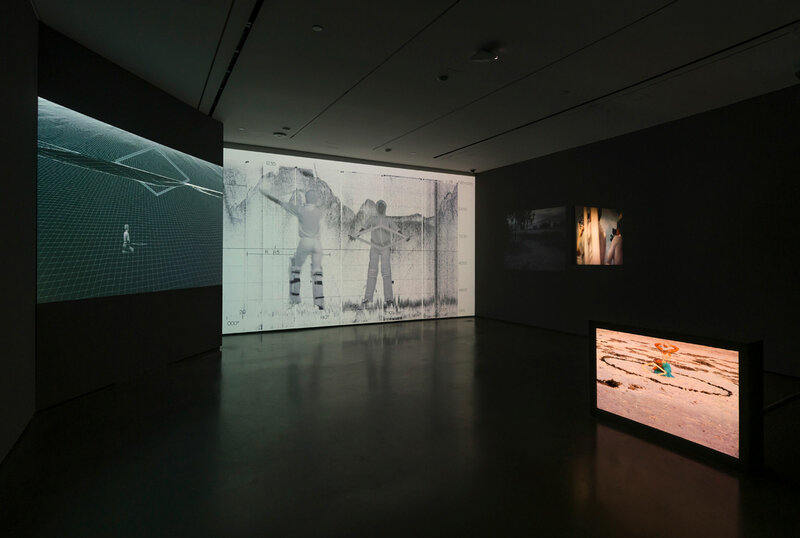 The idea of deep-sea landscapes and their capacity to perform as infinite is especially important to Sabur as someone who migrated from Jamaica to Miami as a small child and who was undocumented for more than two decades. She believes that the fluidity of these spaces allows for alternative notions of nationhood and sovereignty, a life without borders, transcending the rigidity of state-sanctioned boundaries on land. The fracture zone is located along one of the main arteries of the transatlantic slave trade, and her actions also serve as a prayer of solace dedicated to the more than two million African people who were thrown overboard or whose lives were lost in the violent bowels of slave ships. In another sequence Sabur dons a stark white traditional cricket uniform, undulating her arms until they start to blur into an endless loop. The individual traces of her movements add up to exactly 120 gestures, referencing the Rossby whistle, a phenomenon in the Caribbean Sea that repeats every 120 days. First detected in 2016 by ocean scientists from the University of Liverpool, the phenomenon occurs when a type of wave known as a Rossby wave reaches the western boundary of the Caribbean basin and then seems to disappear as its energy is transferred to the seafloor, only to reappear on the eastern side of the basin. The oscillation produced is analogous to the movement of air in a whistle and can be detected only in outer space via satellite. The resulting “sound,” which registers as an A-flat but is inaudible, is now used as a tool to predict coastal flooding in the region. Sabur’s interest in the Rossby whistle and its practical applications sheds light on the current impact of global warming. The United Nations Department of Economic and Social Affairs has identified the small island developing states (SIDS), largely in the Caribbean, as economically vulnerable because of disasters caused in part by climate change. 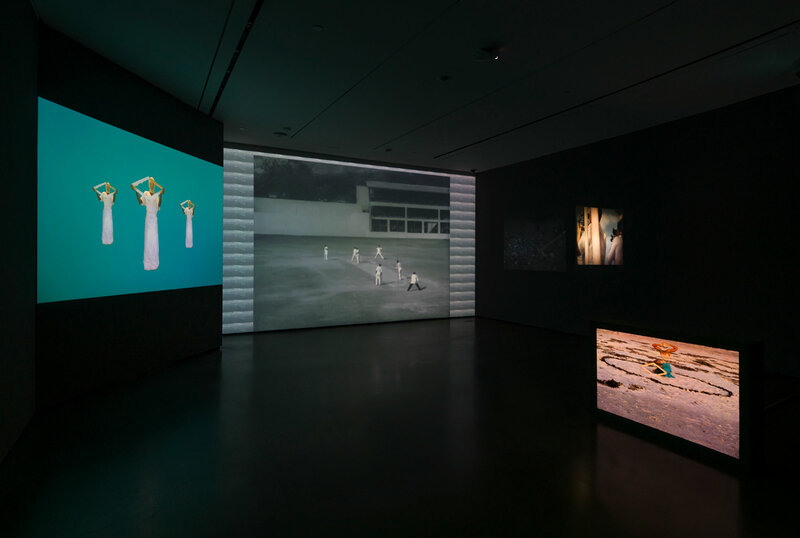 Her embodiment of the paradox is in line with the American writer and scholar Fred Moten’s concept of the blur in contemporary art as “a general insertion of inseparability, which nevertheless, still moves in as a ubiquitous and continual differentiation of breaking, or cutting, or scoring.”3 This notion also supports the formal composition of the installation overall: a radical network of mined images collaged together to house a new reality. Standing on that old parade ground, which is now a cricket field, I could feel the dead generations crowding me. Here was the oldest settlement of freedmen in the Western world, no doubt. Men who had thrown off the bands of slavery by their own courage and ingenuity. The courage and daring of the Maroons strike like a purple beam across the history of Jamaica. And yet as I stood there looking into the sea beyond Black river from the mountains of St. Catherine, and looking at the thatched huts close at hand, I could not help remembering that a whole civilization and the mightiest nation on earth had grown up on the mainland since the first runaway slave had taken refuge in these mountains. The scene then transitions to a grainy 16mm image of an unidentified landscape overlaying a multiplicity of crashing waves. The footage features the Blue Mountains, the longest mountain range in Jamaica, which include one of the highest points in the Caribbean, Blue Mountain Peak. The mountain range spans four parishes: Portland, Saint Thomas, Saint Mary, and Saint Andrew, where Sabur was born. These mountains, known for their lush greenery and towering trees, are also historically significant as a site of fugitivity, first for the indigenous people of the island known as the Taino and then for a community of runaway slaves known as the Maroons. In the footage the Blue Mountains hold court above a stadium of sports fans until the camera pans down to reveal a cricket match in progress. Cricket, the most popular sport in the region, is a vestige of colonization, brought to the West Indies by way of the British military in the late eighteenth century. Sabur highlights the sites of these complicated legacies to underscore ideas outlined by the Martinican scholar and philosopher Édouard Glissant in his seminal text Poetics of Relation: “The thing that makes the understanding of every culture limitless is precisely the thing that allows us to imagine, without approaching it, the infinite interaction of cultures.”5 For Sabur, reframing the historical context of cultural exchange and social integration in the Caribbean has the potential to offer insights into a global futurity. Overall, Sabur’s roaming expedition is set in place to offer a more expansive view of the Caribbean, mining its dynamic landscape and cultural contributions as a basis for reframing a site that transcends boundaries. 1. Sabur, in “Water as Memory and Dreams: Jamilah Sabur Interviewed by Monica Uszerowicz,” Bomb, November 18, 2018, bombmagazine.org/articles/water-as-memory-and-dreams-jamilah-sabur-interviewed/. 2. M. Jacqui Alexander, Pedagogies of Crossing: Meditations on Feminism, Sexual Politics, Memory, and the Sacred (Durham, NC: Duke University Press, 2005), 288. 3. Fred Moten, “The Blur and Breathe Books: A Lecture,” Tisch School of the Arts, New York University, February 24, 2016. 5. Édouard Glissant, Poetics of Relation (1990), trans. Betsy Wing (Ann Arbor: University of Michigan Press, 1997), 172–73. Lead funding is provided by Hope Warschaw and John Law and by the Hammer Collective. Generous support is also provided by Susan Bay Nimoy and Leonard Nimoy, with additional support from Good Works Foundation and Laura Donnelley, and the Los Angeles Board of Supervisors through the Los Angeles County Arts Commission.